Did you know that 40% of all our food goes straight to the waste bin? 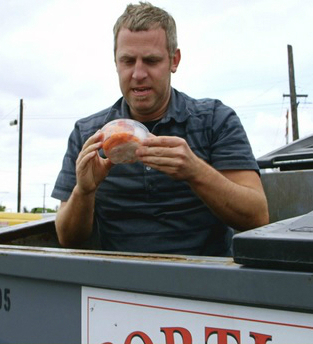 After discovering this unfortunate reality of our food and grocery industries, director Grant Baldwin and producer Jen Rustemeyer decided to venture on a waste-free lifestyle. The two ate only discarded food for six month and documented their experience and discoveries along the way in Just Eat It: A Food Waste Story. The documentary is screening at VIFF 2014 this year (September 25th to October 10th) and we had the chance to chat with Baldwin to find out a little more about his intriguing documentary. TICKETS. VIFF: What inspired you to make Just Eat It: A Food Story? Baldwin: My previous film was on waste reduction, so food waste was a natural next topic. Once I found out that 40% of food was wasted, I couldn’t not make this movie. I also found a lot of issues based documentaries very heavy, and I wanted to make a positive film that was both entertaining and educational and could empower individuals to change their lives. VIFF: What was the biggest challenge you faced while making this film? Baldwin: Being the filmmaker as well as one of the subjects. It was already difficult to undertake our food rescue challenge let alone film it. Gaining access to food waste was another issue “Hey, do you think we could come in your factory and see how much food you’re throwing away?” Luckily a few progressive companies came forward and opened their doors to us. VIFF: What’s the main message you want people to take away from the film? Baldwin: Wasting food is really not ethical, and it shouldn’t be socially acceptable. Once you learn about the number of hungry people in this country and the environmental impacts of food production, there is no excuse. Fortunately, food waste something that we, as individuals can actually do something about. Baldwin: I really look up documentary filmmakers who make accessible stories like Ian Cheney (King Corn). In terms of cinematography, I’m inspired by action sports films, like movies from Sherpas Cinema in Whistler; they are constantly pushing the boundaries of perspectives, creative shots, and camera movement. Baldwin: If you really want to make movies, watch lots, and then make one! Don’t use lack of a big budget as an excuse; we were really lucky to have BC’s Knowledge Network on board with this project, but I also wore many hats – shooting, editing, scoring, colour correcting, etc. Technology has come so far that it is possible to buy a camera and put together a decent film that will get you in the door to other things. VIFF: Is there a question you’ve never been asked but always wanted to answer? Baldwin: What’s your favourite roll in film-making. I often get asked about the topic of my films, but I also love to talk tech about cameras and the behind the scenes. I got my start scoring films and transitioned into directing, but now I’m really drawn to shooting and the technical side of cinematography. Get your tickets today, the film will screen on Oct. 6th at 1:30pm. Tags: #mustseeBC, BC Spotlight, documentary, food, grant baldwin, just eat it, landfill, viff, viffest. Bookmark the permalink.